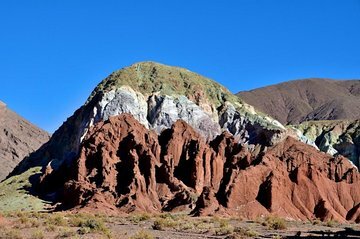 Keep your camera to hand as you journey through the startling landscapes of the Rainbow Valley on this 4-hour morning excursion from San Pedro de Atacama. Learn about the unique geology and mineral-rich rocks of the Domeyko Mountains that give the valley its name, as you weave your way though the multi-colored rock formations. Next, take a peek at the pre-Columbian ruins of Hierbas Buenas, famed for its ancient petroglyphs, then visit the handicrafts village of Rio Grande. The pick up is included from your Hotel in San Pedro de Atacama, remember that it haves to be nearby the town. If your Hotel is located outside the pick up location, we will be letting you know by email how we can arrange it. Good trip and an excellent guide. Very knowlegeable about the geological features of the Valley. The Rainbow Valley was spectacular. Tour includes breakfast. Really enjoyed this tour, and the colours in the valley were spectacular. Only four in the group with a mix of Spanish and English speaking. He took time to explain geology features, and did not rush us. some area land were difficult to drive after snow melting, the driver did best to drive over and the guide helped us took nice photos. It was an impressed tour. Muito bonito e interessante. O guia Ricardo faz a diferença dessa excursão. As explicações da formação das rochas e do seu povo antigo foram muito interessantes.